Odds are you didn't manage to get a ticket for the Madoka double feature, especially if you live on the East Coast. I would love to tell you that you didn't miss out on anything and that you're better off rewatching your Blu-rays in the comfort of your own home away from the madhouse that is the Modern Anime Fan Hivemind. But no, I'm afraid you did miss out on everything and should feel terrible right about now, as your $200+ TV series set has been rendered obsolete by this definitive Puella Magi experience. I know what some of you may be thinking, these recap films animation studios pump out are nothing more than a way to kill time between broadcast seasons and manipulative cash-grabs. I won't split hairs, these first two films of the planned Madoka trilogy are indeed a cash-grab, but what otaku-centric media isn't? I had qualms about the whole deal from the moment I booked my ticket to the first waft of nerd funk in the theatre lobby, but those doubts were put to rest before the first hour of film had passed. If you don't know what Madoka Magica is all about, first allow me to welcome you back into the civilized world after your two-year spirirtual journey across the desert. I'm not sure what you are doing piddling around with this anime crap after achieving enlightenment, but please allow me to indulge your curiousity. Madoka Magica is the story of a group of Japanese middle-school girls who turn into magical girls to fight the witches that are devastating the town. The first film covers the first eight episodes of the TV series while the second film compiles the last four. Every minor gripe I had with a scene, a line delivery, or an insignificant character animation has been revised to a degree of such surgical precision that it’s impossible to see the seams. The words "Shaft" and "subtlety" hardly belong in the same sentence, let alone the same universe, but the studio that brought you such nuanced harem character studies as Nisemonogatari did a phenomenal job with all of the modifications to the original television series. Forget the lure of additional content, what you should really be excited over are the gallons of polish that have been liberally poured over the details of the original show. Any and all visual goofs and clunky dialogue from the original have been smoothed over, redrawn, completely chucked out, or ever so delicately reworked. It’s scary to think that every minor gripe I had with a scene, a line delivery, or an insignificant character animation has been revised to a degree of such surgical precision that it’s impossible to see the seams. That said, Shaft didn’t shy on the spectacle when it came time to rehaul the best scenes of the show. Scenes that were fine just the way they were are made at least twice as good for the film. Maybe it was the blaring theater speakers or the voracious atmosphere in the audience, but every emotional or violent peak from the series seems to be much more punctuated in the films, even when the edge was taken off the shocking bits after several rewatches of the TV series. Aside from the generous application of eye candy, the best additions to the films are the ones that are embedded deep into the most familiar scenes, giving them an extra flourish to push them over the top. Together, the two films run just over four hours, yet the films are so dynamically crafted that the time just flies by, especially once the more ponderous Sayaka act ends. Keep in mind, this is a recap, not a reimagining of the series as is the case with Studio Khara’s Evangelion films. Any major beefs held with the television series will carry over to the films. I’ll sidestep spoilers just this one last time, but know that if you didn’t like the series for plot reasons, character writing, or generally the premise and what it did and didn’t do for the genre, nothing changes in that regard. The first two parts of the Madoka Magica movies are fan pandering done right. As beautifully as the main series recap ends, I’m wary of this third film. The new thing Anime seems to be trying to push are events of series that should remain as they are. Why stop at television when there can be a movie? Why not make the movie a trilogy series? What if things that ended well actually didn’t and now the gang needs to get back together and fight the bad guys again? I’m at a loss as to what more could possibly have been left to say after the original ending, and the teaser for the final film isn’t too promising. The first two parts of the Madoka Magica movies are fan pandering done right, but now we seem to be on track for a film that might undermine the message of the original for the sake of one last guaranteed dollar to be bled from the Madoka property. 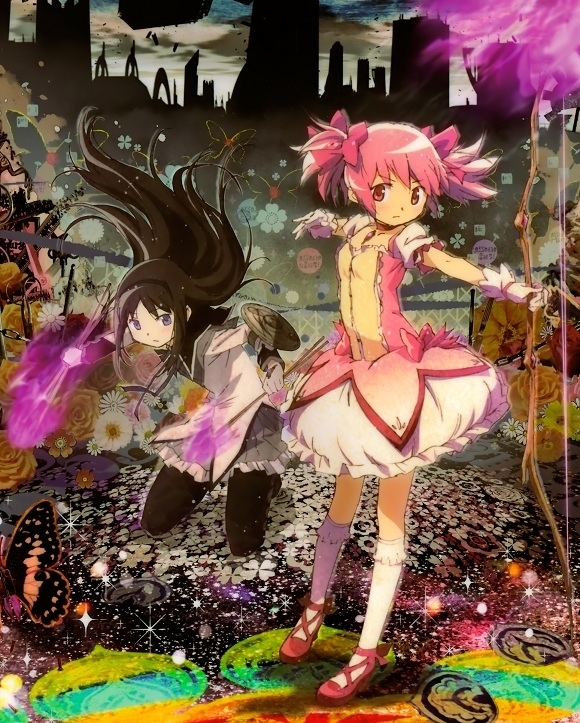 In any case, Puella Magi Madoka Magica Movie Parts 1 and 2 are fantastic not simply as companion pieces to the series, but as the best possible editions of the Madoka Magica story yet.